When Erin was born and we became parents for the first time we (I, really) took many pictures. I’ve taken fewer pictures of Adrian, the second child, than I did of Erin; but Annie Lebowitz has taken fewer pictures in her life than I took of Erin when she was born. “Shutterbug” doesn’t even come close to describing what I turned into. It is wonderful to have so many pictures of her childhood, and although Adrian is getting shortchanged a little bit, he is still well ahead of the curve in photographic evidence of his early life. I can count on my fingers the number of pictures I have of my own early years, so I’m probably (definitely) overcompensating with my own kids, but I love having the memories so available. We started a project shortly after Erin was born that we finally finished a couple of weeks ago (so….three and a half years altogether). Every six weeks or so until Erin’s first birthday we’d drive down to Santa Cruz, go to the arcade at the boardwalk, and take a family picture in the photobooth. We always went to the same booth, and we sat in the same positions in all of them. We kept the pictures in an ever-increasing row on the fridge, held together by magnets, until we ran out of magnets. Then the pictures went into a drawer as we promised ourselves “someday we’ll frame them”. That someday has finally come. After moving into our finally-renovated house the pictures wound up on a shelf that was a little too out-of-sight for us to see them and remember to get them framed, but Emily finally recalled that it was something she wanted to do. So she took them to frame store and came home with our new prize. But I’ll always regret not doing the exact same thing for Adrian. He’ll never get us all to himself in the way that Erin did, and the year-long sequence on the wall is a reminder of that. I know that’s just what happens in families with more than one child, but it still makes me a little sad. I like having the picture on the wall, but I feel like I need to make it up to him somehow. I’ll probably feel like that for a while. I have three kids, so you can imagine how cheated my youngest daughter feels. In my own family, there were four of us, and the only picture of my youngest brother is of him in the bassinet (out of sight) and us gazing in at him. It is the truth – the second, third and so on children do get shafted on the paparazzi end of things. I love that you framed these photos! Although it is not the same as your photo series, I am obsessed with taking photo booth pictures with all my kids. I have them on magnet on the fridge, and in a row at my work on my bulletin board, and have a tab for them on my blog (although I REALLY need to scan the older ones and get them up there!). You created a fun and different collage that I admire. We have three boys, twins and a younger one. I sometimes feel the same way (though there are advantages to being a younger child — I know I am one). Still, why not create a project around Adrian that fits who Adrian is? Maybe it won't be Adrian alone with his parents, but maybe Adrian could be the focal point. Just a suggestion. We have three boys, twins and a younger one. I sometimes feel the same way (though there are advantages to being a younger child — I know I am one). Still, why not create a project around Adrian that fits who Adrian is? Maybe it won’t be Adrian alone with his parents, but maybe Adrian could be the focal point. Just a suggestion. This is a great post. It makes my heart heavy. I love the idea though. Even more than the pictures, I miss the fact we haven't taken as much video of our youngest in comparison to our first. It makes my heart ache to think, in 20 years, I'm not going to remember the way my youngest son's voice sounds at this very moment in time. Great. Now I’m feeling guilty about THAT TOO. Great. Now I'm feeling guilty about THAT TOO. Even more than the pictures, I miss the fact we haven’t taken as much video of our youngest in comparison to our first. It makes my heart ache to think, in 20 years, I’m not going to remember the way my youngest son’s voice sounds at this very moment in time. That is extremely cool, excellent idea, man! There are four times as many photos of our first born as the others. 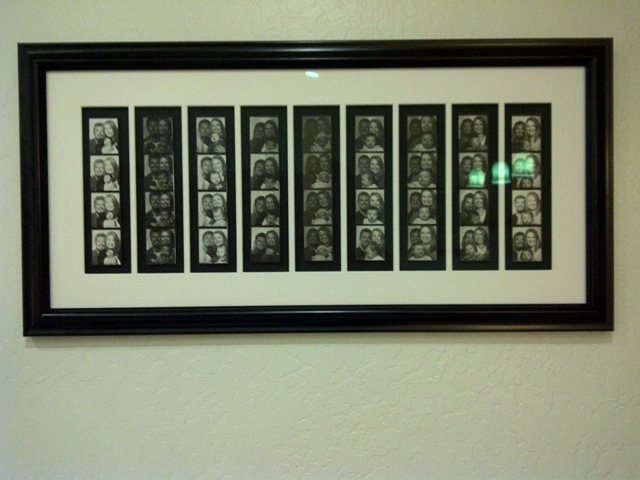 Actually, there are probably not that many less of the others, but the first one is the only one with framed photos…. The others won't get to see theirs until they can navigate the external HD system and figure out my "filing" system. never be able to find the pictures. Good thing they didn't switch out the picture booth for one of those ridiculous morphing ones. That would have pretty pretty funny though.